Looking for some fun on the social media sites or the messengers on which you chat with your friends like whatsapp on the android market? You can see the comical image of the superman here in this photo editor and there's provision to put the face into the hole on the image effect. You can create your own funny picture on any of your friends. There are endless ideas that can be used for creating funny pictures. 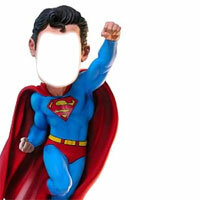 This is the superman mask template on our website and its quite simple to create pictures. Have fun, try the photo editors now.